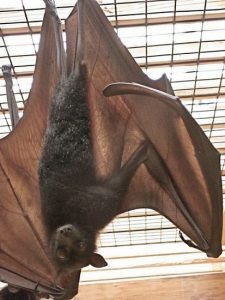 The Large Flying Fox is a species of large fruit bats that are found in parts of Southeast Asia. They get their name from their elongated face that easily reminds of a fox. 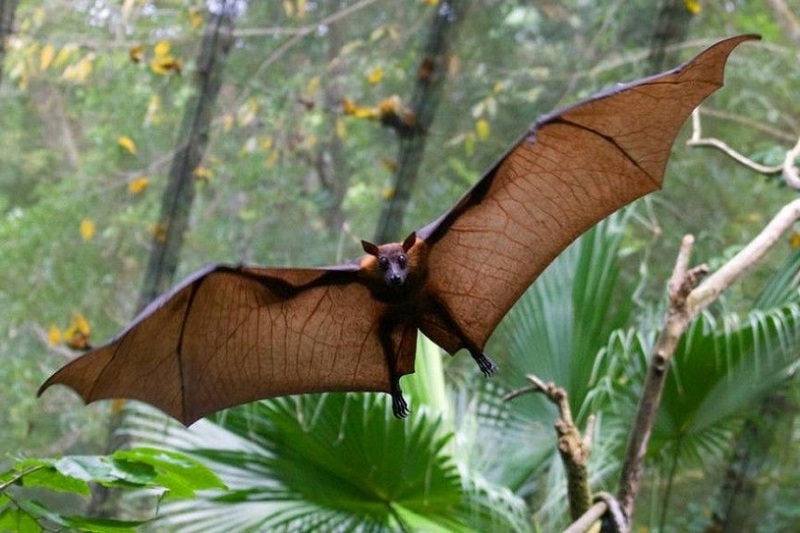 It is among the largest species of bat and is known in different names, viz. 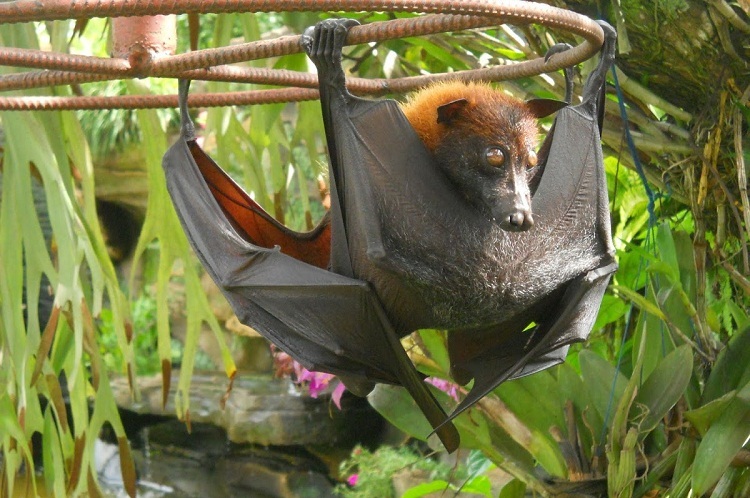 greater flying fox, Malayan flying fox, Malaysian flying fox, large fruit bat, kalang or kalong. Size: The head-body length (or, the height while hanging) is 27to32 cm (11to13 in) with a wingspan of up to 1.5 m (4 ft 11 in). Weight: On average, they can weigh between 0.65 and 1.1 kg (1.4 and 2.4 lb). Fur and coat: The dark-colored hairs on its body are rather long and woolly that turns shorter and more erect on the upper back and near the head. Body: They lack a tail and have pointed ears. They have a large and strong skull with a total of 34 teeth. Sexual Dimorphism: The male specimens tend to possess slightly stiffer and thicker coats than females. The longevity of the large flying fox is around 15 years in the wild, and up to 30 years in captivity, like in the zoo. The native range of these bats is Indonesia, Malaysia, China, Myanmar, the Philippines, Singapore, Vietnam, Timor-Leste, and Thailand. The large flying foxes prefer tropical and terrestrial forests, rainforest biomes, wetlands swamps, as well as agricultural and riparian lands. Currently, no subspecies of these bats have been described by the biologists. These bats are very social animals and tend to be highly vocal. They live in large groups that can exceed up to a few thousand, while their feeding group can range anything between 2 and 50. They are nocturnal, and leave their roost after sundown and come back before sunrise. They can fly long distances with some individuals covering up to 50 km every night in order to reach their feeding grounds. 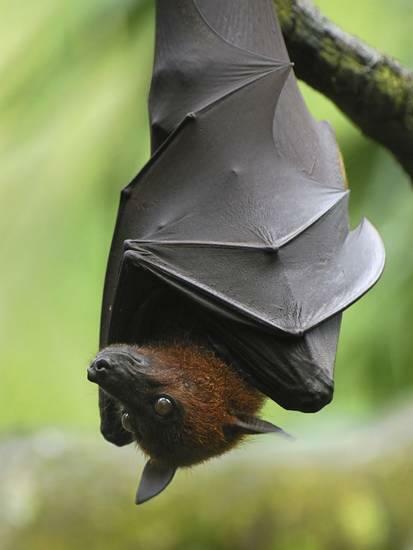 Like most other bat species, the large flying foxes generally land on the branch tips and hang themselves upside down, and are highly territorial. 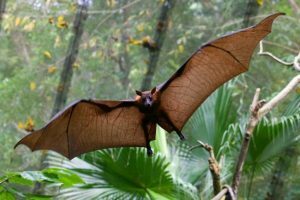 When they see other stranger bats, they will try to communicate their ownership by stretching their wings, emitting growling sounds, or creating other vocalizations. The large flying foxes are herbivores, or more particularly, frugivores, feeding mostly on fruits like bananas and mangos, as well as leaves, nectar, pollen, flowers, and other plant matters. These mammals are mostly polygynous. The males take charge of a small harem of females and can mate with up to ten females. The males that have a dominant nature, occupy the best roosting sites, maintaining a social hierarchy with other males. 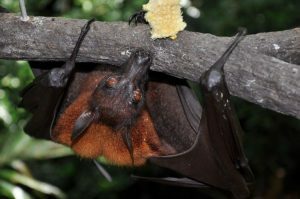 The female flying foxes produce a single offspring, with the litter size of up to two, between March and May, depending on their location, after a gestation period of 140 to 192 days. The mother bat carries the baby initially, for the first few days after birth. Soon, they leave the juvenile at the roosting tree, as it goes out to forage after sunset. It takes around two to three months for the young bats to wean. They take about two years to attain the age of sexual maturity. 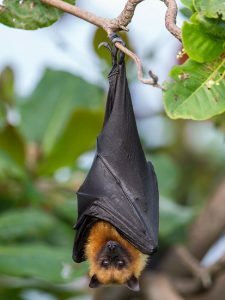 Adult flying foxes with larger wings have the habit of resting by wrapping their wings around their bodies so as to keep off any kind of light entering their eyes. Their wings are somewhat rounded at the tips, which allows them to fly slowly. During the warm summer days, they have developed a behavioral adaptation of trying to cool themselves by fanning their wings around them or licking their bodies. Because this species lacks the ability to echolocate, they have been compensated with well-developed eyesight. Except for humans, no other information about the predators of these huge flying mammals exist. Considering their gradual decrease in population, the IUCN 3.1 has declared them as ‘NT’ (Near Threatened). The presence of flowers on the trees seems to encourage territorial behavior in these bats. 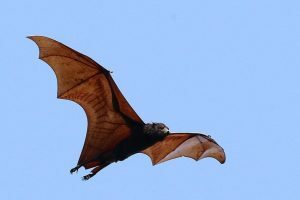 The large flying foxes are known to carry two kinds of diseases that can pose a serious risk to human health, viz. bat lyssavirus and Hendra virus. However, infections from these viruses are very rare. In Malaysia, almost 22,000 large flying foxes are legally hunted each year.